(79"x79")Extra-Large Outdoor Water Resistant Picnic Blanket Mat Rug Camp Beach Extra Large Size: 200x200cm which is about 79x79 inch, perfect for 5-6 adults sit..
SPACE SAVING: Redcamp foam sleeping pad for camping features egg shape design and accordion-style design. Peaks and valleys work together to reinforce support c..
Backpacking pad provides you with comfort!The sleeping pad will make you feel like youre snling in your bed! Comfortable Body Mapping Technology: Specially d..
Get a restful night's sleep, even when you are sleeping outside with the Foam Sleeping Pad by Wakeman Outdoors. The nonslip thick premium foam mat offers advanc..
Cabeau's patented Evolution Pillow is a memory foam travel pillow with eight unique features, including 360-degree head and chin support, a removable washable v.. The Kamp-Rite 4x4 Oversize Self Inflating Pad is a versatile sleeping solution for a wide range of settings. The CFC free foam pad is fully bonded with a Micro .. The Air Comfort Roll & Go Inflatable Sleeping Pad is guaranteed to keep you comfy on the go whether youre camping in the summer or backpacking through the mount.. The Kamp-Rite 4x4 Mega XL Self Inflating Pad is a versatile sleeping solution for a wide range of settings. The CFC free foam pad is fully bonded with a Micro S..
(79"x79")Water Resistant Foldable Picnic Blanket Mat Camping Beach Pad(Purple Plaid) Extra Large Size: 200x200cm which is about 79x79 inch, perfect for 5-6 adul.. Pack compact nighttime comfort and support when you have a Coleman Self-Inflating Camp Pad. Just roll it out and open the free-flow valve and the pad will autom..
Get a restful nights sleep, even when you are sleeping outside with the Foam Sleeping Pad by Wakeman Outdoors. The nonslip thick premium foam mat offers advance..
Get a restful night’s sleep, even when you are sleeping outside with the Foam Sleeping Pad by Wakeman Outdoors. 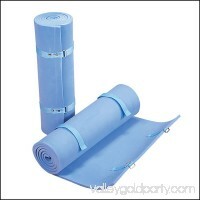 The nonslip thick premium foam mat offers advanc.. The packlite is blue with 2 padded web strap carry handles. It is a lightweight camping/backpacking pad made of closed cell foam insulation. It measures 72 by 1..